Most of us don't have the time or inclination to research every type of dog product on the market. Even a pet product reviewer like myself doesn't personally review everything. As an Amazon shopper, though, I often rely on reviews from people who actually have purchased a product that I need for my pets. So here's a way for you to take a short cut by getting the benefit of Amazon's most popular and highly rated dog products in 10 categories. 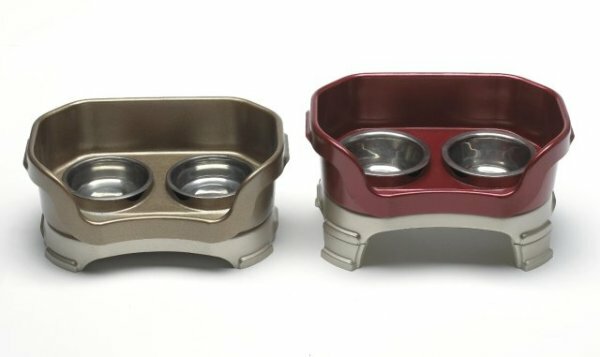 If you hate cleaning up the mess your dog leaves behind every time he eats or drinks, I urge you to think about getting the Neater Feeding Bowl. The bowl is virtually kick-proof and spill-proof as it is specially designed to catch and limit spills and splashes. It also separates wet spills from dry spills to keep mess to a minimum. Even better, it has elevated bowls, and you can make them even higher by getting leg extensions to give your dog an easier time eating from his bowl. Yes, it really is possible to have less sloshed water and drops of food everywhere as these rave reviews confirm! Of course, large dogs need their food and water bowls raised higher than medium and small dogs to protect their alignment and prevent strain. IRIS Airtight Elevated Storage Feeder With 2 Stainless Steel Bowls affords that protection and more: it gives you a space to store your dog's food! Isn't it handy? The IRIS is great for large dogs, but it also comes in small and medium; all are raised to appropriate heights and containers hold 16 to 64 cups of food depending on height. The large feeder is 15 inches high by 21+ inches long. The IRIS Airtight Elevated Storage Feeder with 2 Stainless Steel Bowls is a winner and is well-priced on Amazon. 0When a product gets over 1000 reviews and they are pretty much all perfect scores, you know you have something really well designed and well priced. 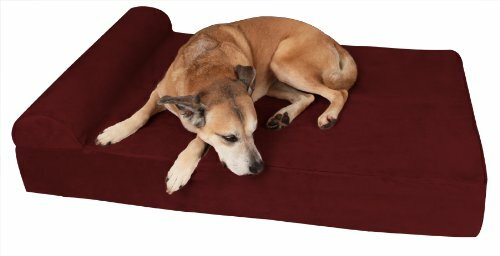 The Big Barker 7' Pillowtop Orthopedic Dog Bed comes in three sizes to accommodate large, extra large and gigantic dogs. The bed is especially designed to not flatten or get saggy for ten years and it is made with high quality American-made foam. It is good looking, soft, water-resistant faux suede and it is easy to clean. Reviewers gush about how it keeps its shape! The trend in dog harnesses is in: it's the 'front range' harness. For best control of your dog, large or small, the front range harness puts the pressure (not pull!) on your dog's chest (not neck!). This is the strongest part of the front portion of your dog, containing the most massive muscle area of his front. Chai's Choice "Truelove" Front Range Dog Harnesses are a favorite of more than 2,000 dog owners that shop at Amazon. Most say it's the best harness they've every owned. There are reasons for that. First the harness comes in five sizes from x-small to x-large and each part of the harness is adjustable so that various areas of your dog's body can be fitted to his specifics. The multiple straps offer support to many parts of your dog's chest and back, especially necessary for small dogs and dogs that are underweight or disabled. Straps are nylon mesh with soft sponge backing in the chest and tummy area. Visible straps are covered with 3M reflective material for night visibility. Chai's Choice is also furnished with a seat belt handle so you can loop a seat belt through it for travel. Again, the front range harness protects your dog from choking in such an event as a car accident. A feature of Chai's Choice is its lifting handle, 'handy' in case your dog isn't reacting to the pull of the leash! Visit it here at Amazon. Oh boy! There are several best selling dog brushes on Amazon and the number of positive reviews for them are so close that I can't honor one above the other. So, I'll give you a few of them. One caveat: These are NOT DE-SHEDDERS, but brushes. They do a so-so job at de-shedding, but focus instead on de-tangling, stimulating growth of healthy fur, and also stimulating skin. They should feel pretty good on your dog. The kind of dog brush you buy depends on the thickness of your dog's coat and whether or not it tends to mat or tangle. These two brushes, the Slicker Pro and the Hertzko are both top sellers on Amazon and are rated very highly by customers. They are similar: both have contoured, comfortable rubberized handles, wire bristles, and are retractable. When their tines retract, bristle hair is released and the brush cleaned. I like the Kong ZoomGroom for dogs with dense fur. It does a fair job of de-shedding and a great job of massaging. It has a five-star rating on Amazon with almost 2,000 reviews. It is hard rubber, so it is also promoted as a dog toy, but I use it as a brush! Shedding is a big bugger for many dog owners, but the FURminator gets thousands of perfect scores from owners who use it. Recently, FURminator customized its offerings so that dogs with long fur can use the (yup, you guessed it!) "Long Hair" size, and those with fur shorter than 2 inches can use the "Short Hair" size. Then you have the pick of widths for your FURminator, from Extra Small to Giant, depending on the size of your dog. Customers really love this device. And why not? It removes fur from your dog before it gets all over your house and you have to vacuum it up. (Check out Best Upright Vacuum Cleaners and Best Hand-Held Vacuums for pet hair pick-up.) 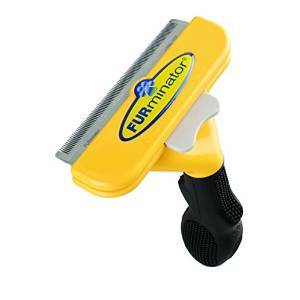 The Furminator is made of high quality stainless steel and has an ergonomic handle for the groomer's comfort. (It was, coincidentally, designed by a dog groomer.) It also has a handy FURejector that removes fur neatly from the de-shedder once it's full, so you don't have to get up and empty it. 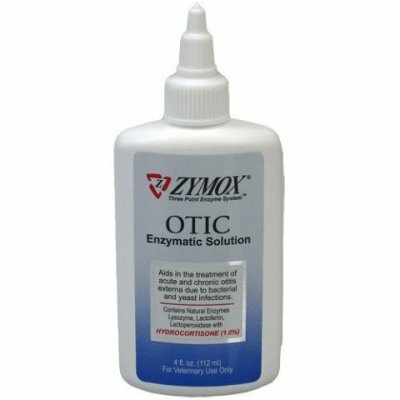 A 5-star dog health product with over 3000 sterling customer reviews, Zymox Otic Pet Ear Treatment, probably doesn't need me to write anything more about it. But, I will add something short: I washed my dog's itchy ears with dog ear wash over, and over, and over again. He didn't stop scratching (and smelling bad) until I used Zymox. Ear infections, be gone! Nutramax is one of the leading pet supplements for dogs and cats. But Nutramax Cosequin DS PLUS MSM Chewables are the best selling ones on Amazon, with the main ingredients Glucosamine (600 mg), Chondroitin Sulfate (300 mg), and MSM (250 mg) all at work to support your dog's muscle, bone, and joint health - and that's what he needs! I give my dogs and cats Nutramax Cosequin products daily starting at age 6 to keep them in shape. Dosage is based on weight and is advised on the product's packaging. You've probably seen infomercials on the Thundershirt and wondered if it really works to calm your pup during thunderstorms or windstorms which tend to frighten pets, sometimes so badly they can't quiet down. The consensus of 5,000 reviews on Amazon is 'yes' it does work, and I agree. I've had one for quite a few years and have used it for two dogs, both who were so fearful and anxious during a storm that even holding them in my arms wouldn't comfort them. Now, I use the Thundershirt and crate my dog, sitting next to the crate and talking calmly to him until he quiets down. This shirt can be used for any kind of anxiety or fear your dog expresses. It's great if you're bringing home an adopted dog, or have a dog who fears new settings, like the car, or a dog park. It even serves as a cozy jacket when it's chilly outside. The wrapping up of your dog in a Thundershirt is not necessarily instinctive, so keep the package directions. Other models of the Thundershirt are also available at Amazon. Almost 10,000 dog parents reviewed Taste of the Wild Dog Food and think of how many more purchased one of this brand's varieties who have not reviewed it! My dogs and cats have been chomping Taste of the Wild since they were young'uns and still love it. Occasionally, I'll change from a seafood formula to lamb or beef, just to give them a change; they're happy with Taste of the Wild and I know they are healthy too. Taste of the Wild pet foods are all grain free. The proportion of real protein to healthy fruits and vegetables is on par with more costly brands. Would you believe that a tasty treat designed to help your dog swallow pills would become a best selling dog treat on Amazon, beating out all the other tasty tidbits? Well, it does. The Greenies come in two varieties - one for disguising tablets and another to disguise capsules - and in four flavors to disguise the yucky taste of the pills. Their squishy consistency can be wrapped around the meds so your dogs won't even know they're swallowing anything but a treat! Some customers say they can use just 1/3 to 1/2 of a Greenie for each pill, stretching out their dollars. Check out the raves on the Greenies at Amazon. Circulating water is attractive to pets, especially dogs and cats, and both species tend to get dehydrated easily, making the Drinkwell Platinum Pet Fountain an even more important buy. But there are other features of the Drinkwell that make consumers rave: a very large water capacity, superior filtering system, and detachable cord, making it so much more convenient to clean. 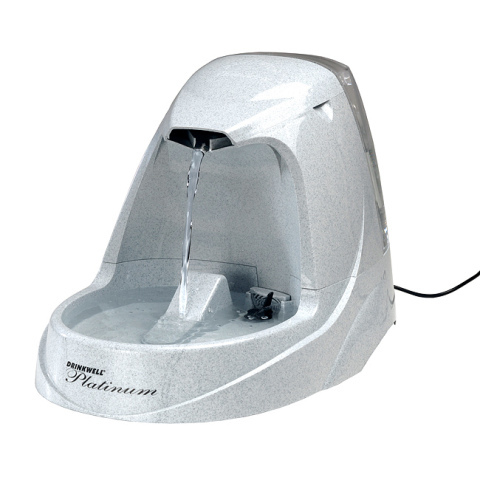 The Drinkwell Platinum Pet Fountain holds 1.3 gallons of water and filters it to remove bad taste and odors. (Filters sold separately.) Its parts are upper-level dishwasher safe. It's great for multi-pet families! I and several thousand other reviewers have kicked the Midwest Life Stages Double-Door Folding Metal Dog Crate up to number one best selling dog crate on Amazon, and there are plenty of reasons, not the least of which is the high quality for a great Amazon price. Often, dog owners use crates as a place to punish their dogs, but crates should be used for house breaking initially, and then as your dog's own special place where he can go to be left alone, away from the kids, other pets, and yes, even you. I never thought I would keep a dog in a crate overnight, as I am used to dogs sleeping on my bed, but I bought one of the Midwest Extra Large Crates for my adopted pup, put throw-rugs and pillows on the floor and little curtains around the sides, and my dog seems to be quite happy sleeping there at night. It's like his 'apartment,' and he even re-furnishes it with various toys that he hides in there every few days. Solvit Deluxe Telescoping Pet Ramp reviewers stress the importance of training your dog to use the ramp, lying it flat first and gradually lifting the angle as she starts to walk on it, all the while using treats to encourage your dog's movement along the ramp. Be patient; she will get it. The above 10+ best selling dog products on Amazon.com are best selling because they are high quality products that work; the reviews tell you that. So take the advice of other dog owners and save yourself some time searching for the 'right one' on your own.